That was a friend’s reaction to our shirts capsule collection last week. Basic though it was, capsule posts like that give guys a solid, straightforward guide to what they should be investing in. While we all want to buy quality things, that last well and even look better with age, these things cost money – and so mistakes are even more costly than usual. If posts like that give guidance from a style point of view, the flip side is guidance from a quality point of view. What actually makes something better quality? How do I spot it and where do I buy it? Indeed, what different things make up quality? Often there is a mix of factors, each of which appeals to different people. For example, the key quality that men always quote with shirts is that they last well. In that way they’re more akin to socks or underwear, rather than suits or shoes. But when shirtmakers talk about better or finer shirts, they usually mean ones in finer cottons, which may feel silky but are actually more delicate and don’t last as well. 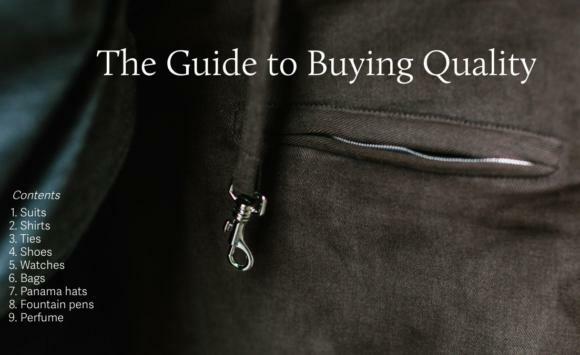 This thinking about quality reminded me of the series I wrote a few years ago, called ‘How to Buy’, which ran on Permanent Style and on the FT How to Spend It website. Over the past week I have run through those old posts, made a few updates, added more links and images, and generally tidied them up. 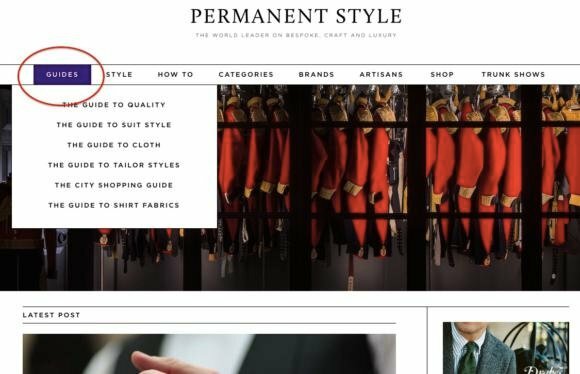 They now make our latest ‘Guide’, which you can access in that section of the navigation menu alongside others on Cloth, Suit Style and shops around the world. The series contains nine articles, covering everything from suits to fountain pens. It looks at floating vs fused canvases, and ebonite vs plastic feeds. The pieces are intended as introductions, as there is lots of detail they cannot go into – and is contained around the rest of the Permanent Style site. I’ve linked to those other pieces where I can. I know these guides have been very popular with newcomers to Permanent Style. There are thousands of these every week, and it feels good that there is now a place to point them to – where they can start to learn, and begin the long dive into everything we’ve written about over the years. And for long-time readers, don’t worry – we’ll be back to technical discussions of sleevehead wadding soon. You can follow the discussion on How to buy quality: The Guide by entering your email address in the box below. You will then receive an email every time a new comment is added. These will also contain a link to a page where you can stop the alerts, and remove all of your related data from the site. Even as a long time reader this is highly appreciated, always good to have something to refer back to. I would love a guide on cashmere! I am trying to build up a small wardrobe of good quality clothes. Due to the higher price of such items, I have a practical question. How many items of each element would you consider the bare minimum to build a practical and functional wardrobe? I work in a very informal office. Since not everyone’s informal is the same, maybe place yourself and your office on the scale below? Well, the majority of my coworkers are ultra-formal (1 in the linked post) while I try to stay between 3 and 5. Although I normally get the odd comment if I wear a jacket, not to speak of a tie. Hope someone (Simon?) can chip in with the number of elements a minimal but functional wardrobe would entail. I think that would likely mean a whole new post, but I can certainly plan one. Something that brings together the various capsule wardrobes into one, perhaps. I’ve looked at the guide and it is very good. I think adding trousers would be helpful. Seconded. Especially since Simon has written numerous articles on the topic. Many more than on some of the other topics in the list. I find those very guides very helpful: thank you for updating them. I have a question about your ‘house style’. Sometimes you refer to yourself as ‘we’ and sometimes ‘I’. For example, towards the end of this article, you refer to ‘everything we’ve written about’, but earlier in the article refer to ‘a series I wrote’. I’m a long-time reader of the site, and have always wondered about these pronoun choices: is there another person with whom you write the articles, or is it simply a stylistic preference? It’s mostly style. I do have people that help out – not on the writing but on other things like admin and research – but all freelance. I read in a comment earlier that you have left job and are doing PS full time. I think really good to have a post soon about this, a bit of transparency about where revenue is from, where it will come from (PS products) and a type of PS charter on what you do here, and that you will continue to be objective , non biased etc! Hi. Sure – nothing at all will change, the same revenue sources, the same impartiality, the same quality. And the same transparency about it. But I can expand on that if you think it would be helpful? What made you decide to park the day job and go full time after all hear years? You do get some quite odd questions , yet seem happy to publish them. Do you get some which don’t make it due to their being even more strange in nature? I look forward to diving in Simon. But a thought occurred – not that you don’t have plenty to cover already, but when I saw that you wrote on fountain pens I immediately thought you should add coverage of pencils for completeness. I had been a fountain pen user for decades but found it increasingly fussy and anachronistic to use it for note taking (in a business setting). This is especially true in the US where I live, but also increasingly true even in France where fountain pens remain appreciated. Simply, it looks odd today and draws attention of the less welcome kind. In my first job in the ’80s, which happened to be in Johannesburg, I was surprised to see that everyone was using a mechanical pencil for their work (I’m an engineer). I’d never used one but jumped right in. Sadly, it was the era when breakages of ½mm lead was a very regular occurrence. It was beyond annoying and as soon as I could, I gave up using them. Yet I remained attracted to the aesthetic of mechanical pencils – especially avoiding the waste of cedar. Roll on to 2017 and I stumbled upon a site here in the US that sells a marvellous selection of writing instruments from Japan. And then the epiphany came – not only do today’s Japanese leads not break – at least for me – but there is a marvellous pencil called “Kuru Toga Advance” that rotates the lead as you write (20 rotations per 360°) ensuring that you avoid that second annoyance of graphite – the tip becoming dull. Additional advantages of this remarkable piece of engineering: I write in compact Midori A5 notebooks where I can fit a remarkably large amount of text on the page. And I have the chance to rediscover erasers (rubbers) – again, the Japanese are ahead here but the German brands remain a worthy choice too. Apparently this continued development of mechanical pencils in Japan is linked to their alphabet. For students especially, having to write in notebooks needs a precision instrument since an incorrect stroke in a Kanji character may mean a completely different word. Now, starting a meeting by whipping out a notebook, pencil and eraser still draws attention where everyone else is clack-clacking on their Notebooks. But mostly of the right kind. And by writing instead of typing I make a far better record of points discussed – but that’s for another day. I do indeed use pencils, having always had a fondness for them since I used to backpack a lot and use them for both writing and drawing. Really interesting. Out of interest, can the Perfect Pencil feel a bit unbalanced? Simon, given your appreciation pencils I would encourage you to seek out this Kuru Toga Advance 0.5mm pencil when you get a chance to try it. It is ridiculously inexpensive – at least here in the US. Other than at the business end, which is metallic, it is plastic. It comes in many colours but the white one is very respectable and it is unbelievably well made for something costing less than $10. The supplied graphite has a soft outer layer around a harder core and is made specifically for the rotating action. You will not fail to delight in using it. Thanks, and thanks for your view on the future of PS. I think that’s a good idea. Given family commitments, I think my backpacking days are over (travelling from Beijing to Islamabad by land, hitchhiking to Morocco…). Great days, but hard to justify now. To be honest I’m also not sure it would be great for high-end clothing – things would have to be very robust, and even good workwear might not be good enough in terms of weight – there would be a lot of synthetics! These are quite good guides, avoiding a common tendency in writing on the subject to confuse difficulty of construction or aesthetically-important features with factors that actually affect durability. In my experience, as long as the item is made by a generally well-regarded maker, the latter comes down to quality of material (fabric for suits, shirts and ties and the upper’s leather for dress shoes) and care. The only durability issues that have led to my tossing an item are ripped or unshapely or faded fabrics/leathers, unremovable stains, and blemishes made by the wash or iron. Everything else has been repairable. Unfortunately, with the exception of bespoke and some MTM, one rarely has access to much information about the material and must resort to trial and error or item-specific recommendations. Simon ~ I have only recently become exposed to the world of bespoke fashion and am glad their are knowledgable individuals, such as yourself, taking the time to share your experiences. Living in Florida and with limited time to travel, I have decided to start out by dabbling in the modified process of ordering online or attending trunk shows. 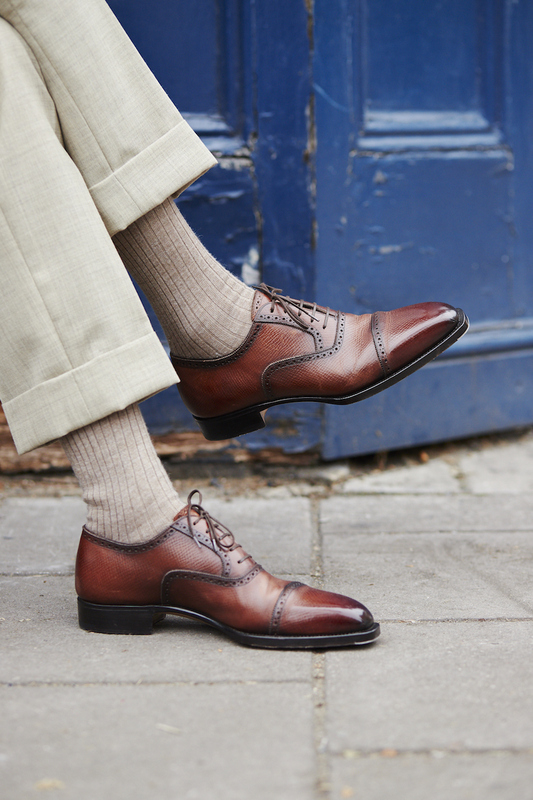 I am in the process of ordering a pair of semi-bespoke shoes from A. Meccariello near Naples by sending him measurements that I have taken myself and I am attending a Solito trunk show next week in New York. If I had my drathers, I would spend a couple months in Italy for the full, authentic experience, but cannot do so at this time. Based on my researched information, garnered through you and others, I am currently very content and excited about working with the artisans I have chosen. However I am curious as to whether I am cutting myself short by not making the effort to do this correctly and thoroughly, as in saving and going and getting measured directly for bespoke shoes from Antonio near Naples and the same with Luigi for a bespoke suit in Naples? I already have a collection of expensive ready to wear suits and shoes that I regret because I didn’t know better. Am I making a similar faux pas? With Luigi, it doesn’t make any difference where he is – he’s measuring you in New York, and would do the same in Naples. With Meccariello, yes you’re not getting the full experience as taking your own measurements and sending them off is less reliable. You’re not a master shoe fitter, after all. Great post and I love the focus on quality, I wrote to you a few months back regarding Jeff Banks suits and I am glad you steered me away from them as I would have paid a premium for a suit of inferior quality. What I am now in need of help with is which shoe company to make a purchase with, I have looked at Churches, Crockett and Jones as well as Alden and they simply aren’t decorative enough for me. Coming from the North East I like to be a little more showy with my style, I have recently stumbled across a brand named Duke and Dexter who make a great pink suede slipper which can even be embroided with any design I like. Have you had any dealings with this company? I couldn’t find a review on your website unfortunately. I buy all my shirts bespoke by a shirtmaker. Actually is Sean O´Flynn. He is brilliant. 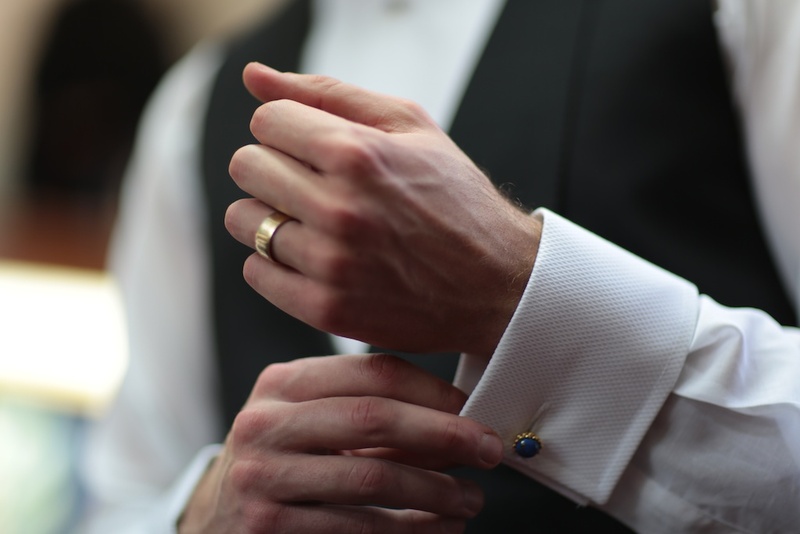 Bespoke shirts are in the formal end of the scale. Maybe I should try a few RTW shirts and get them altered by a tailor? Where do you recommend me to look for RTW shirts in London? And which tailor in London is recommendable for alterations? For alterations, see this post. Hi Simon, I wrote suggesting the travel book. To be clear I thought it might take the form of a ‘Road to Oxiana’ rather than a PS approach. A travel memoir with additional elements updated with more recent travel thoughts. A mention of luggage, clothing etc. as asides. Your schedule is probably pretty full but I wondered about the variegation of your writing into differing ‘brands’. Further to this, as PS expands, and to safeguard the journalistic content, might the retail offering benefit from a little distance from the main brand as a sub unit – again a variegation of purpose and identity – something related to but not identical to PS. Currently you may not see a need but I’m sure the design and product offering will grow and there may a better level of comfort if the two offerings (review based journalism and style products) were slightly separate. I don’t suppose you wanted to take up the challenge I messaged you about on Instagram? Hey Joel. Of posting the cheap RTW suits and see what people think, you mean? To be honest I’m not sure it would be that good an experiment, just because you can’t tell much about a suit from those simple pictures. I think it might suggest too much that opinions about a suit’s make or fit taken from static photos are valid or useful. Does that make sense? It does make sense, although, I would still love to see you in a Primark suit altered to fit by your alterations tailor. I’ve always had this thing in my head that I would like to see someone wearing a high street suit to the Oscars instead of the £5,000 Armani Tux to show the average joe on a salary of £25,000 that they can still look good. I hope that means you will take the challenge. You will get the Wayne’s World “We’re not worthy” treatment. Simon, I have a simple question you might be loathe to answer. What moderately priced, decent RTW suitmakers do you recommend (available in London). I am thinking of not the cheapest but sub-£1000, similar to Gieves & Hawkes. I’ve got two bespoke suits and love them, but I can’t fill a wardrobe with those, and I need some daily workhorses for the office. I’d be happy to answer, but I don’t think I can as I just don’t look at RTW suits often any more.